President John F. Kennedy was born 100 years ago today. More people will remember where they were on the day he was assassinated than the day he was born, but I am using this day to acknowledge the man who is the most prominent president I can remember. The people in my parents’ generation all know where they were when Pearl Harbor was bombed on December 7, 1941. Likewise, people of my children’s generation all know where they were on 9/11/2001, when The World Trade Center was destroyed. And while I remember that day as well, I believe the death of President Kennedy is the defining event in my generation and especially for me. The poignancy of that day never ceases to affect me. I had just given birth to my first child, a son, and was waiting for the nurses to bring our children to our rooms to feed them. I could not understand the delay and then the news came. I think I was in a state of shock the whole time I was in the hospital. 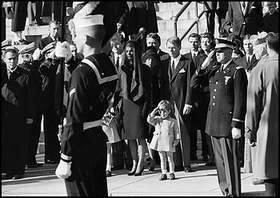 JFK’s death became real to me when I was home with my newborn, watching the funeral procession on our tiny TV, my tears falling down on my son in my lap. JFK held so much promise for our generation. Perhaps he is best remembered for The Peace Corps. On the negative side we have The Bay of Pigs and his dalliance with other women, to the humiliation of his gentle wife, Jackie. 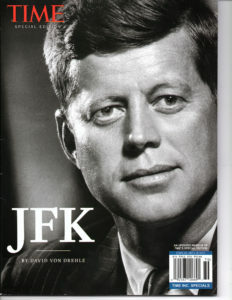 But in the special edition of TIME magazine from which I scanned the cover, he is still one of the most popular presidents in history. This entry was posted on Monday, May 29th, 2017 at 8:53 am	and is filed under Essays (Ellen Sue Says), Home Page. You can follow any responses to this entry through the RSS 2.0 feed. You can skip to the end and leave a response. Pinging is currently not allowed. president certainly is an anomaly–reversing so much social progress.